Whether you’ve got a top of the line gas BBQ or prefer an old school charcoal hibachi, there are plenty of tricks to make your backyard BBQ’ing better than ever before! Getting a handle on bbq’ing isn’t as easy as the commercials for grills make it look! Half the time, most of us end up with food that is either closer to raw or charbroiled to within an inch of becoming old shoe leather! Timing is everything: if the grill is too hot, it can ruin your lovely steaks. If it’s not hot enough or only hot in spots, you can end up with something resembling beef tartar. Once you’ve decided on your method of BBQ’ing (gas or charcoal), it’s time to think about some other ways to make sure you get a great result, every time. You can add flavour to any number of foods by adding wood to the cooking process. For charcoal BBQs, you can add wood chips to your lump charcoal, like hickory or apple wood, that add a smokiness and tremendous flavour to meat and fish. For a gas BBQ, you can soak a cedar plank in water and use that as a cooking surface for various fish and seafood. The smoky aroma from the wood infuses the fish and adds a lot of delicious flavour! Another essential for BBQ’ing is marinades. Marinating whatever it is you are planning to BBQ is a great way to add and seal in tremendous flavour. The best results happen if you marinate for no more than 2 hours. Why? Most marinades contain some sort of acid (vinegar or citrus, for example) and this breaks down the meat or fish a little. You don’t want mushy proteins on the BBQ! TIP: reserve some marinade at the beginning, so that it hasn’t come into contact with the the meat or fish, for basting during the cooking process. NEVER baste with marinade that has been used. If your marinade contains sugar (honey, BBQ sauce, etc…), it will caramelize while cooking and add moisture to your food, but reserve adding more to the last 10 or 15 minutes of cooking, so as not to have it burn. You can make veggie packages, which is foil packages filled with your favourites, a little olive oil and a few spices. Thinly sliced yam, onion rings, mushrooms, peppers and zucchini all make good options. Just layer the veggies with the ones that take longer to cook towards the bottom. Putting veggies directly on the grill is so delicious: Just place them cut side down (peppers, skewers of mushrooms, zucchini, onions, corn on the cob) so they get a little bit of that char and then flip them over for a little on the other side. Salt, pepper and a little olive oil is all these veggies will need once you’ve plated them, to bring out their essential flavours! You can also wrap larger veggies like corn on the cob (shucked) and potatoes with foil, with a little butter, salt and pepper, and place them over a less hot section of the grill, so that they cook with indirect heat. Okay, maybe you won’t actually bake anything on your BBQ, but you can put flat breads, naan or pita bread on the grill, to warm up and get a little sear on them. They’re a great ‘side’ to accompany your grilled items. Or how about some BBQ pizza? Yes! The key to getting this right is to make sure you’ve got all your ingredients ready to go. Why? Because you’re going to grill your pizza dough without toppings first, so you have to be ready to add everything quickly. Take your stretched out dough and oil one side. Place that side down on a high heat grill and let it cook for a few minutes, with the lid up. Check on it because what you’re looking for is the dough to set, not to char. If you’re using a premade pizza crust, all you want to do is warm it! Flip the dough and get ready to add your sauce, toppings and cheese. This needs to be done quickly so you don’t end up overcooking the dough. Close the lid and let it cook for about 5 minutes. You know it’s done when the edges are getting crispy and the cheese in the middle is fully melted. Let it cool for a minute and then EAT! A grill that hasn’t had a chance to preheat before you start cooking will result in soggy food. You want a good hot grill (gas) or for the charcoal to have turned ash grey / white on the top and still red underneath, to ensure the best sear on your grilled foods. Searing doesn’t keep juices in, but it does ensure that the inside is moist, while the outside is nicely charred and flavourful. How can you tell if your grill is hot enough, besides the look of the charcoal or the gauge on the lid? Ask chef Jamie Oliver! He suggests putting your hand 5 inches above the grill. If you have to pull it back in 2 seconds, it’s high heat. 4 seconds? Medium. And 6 seconds? Low heat. Of course, this is all relative to your individual threshold for heat, but it’s a good guess. The easiest way to know if your steak is done is to invest in an instant read thermometer that will give you an accurate internal temperature. Otherwise, you’ll have to cut into your meat to check for doneness, and that will release a lot more of the juices than you might otherwise like. When it comes to chicken thighs or bone-in breast, you definitely should check visually too, right near the bone. If it’s still pink, it’s not done. Starting each BBQ session with a clean grill is EASY if you took a wire brush and cleaned it at the end of your last BBQ session, while the grill was still hot. The heat makes it SO much easier to scraper off any food residue that you won’t want with your next meal! So while your meat is resting, which you should always do after grilling, give the rack a quick brush off! If you can’t find your grill brush, just ball up some foil and use your tongs to rub it along the grill rack. Instant brush! You can help prevent lean foods from sticking by oiling the grill, not the food. Just put some veggie oil on a paper towel and use your tongs to run it over the warming grill rack. You will find that seafood skewers and other lean meats will stick a lot less! 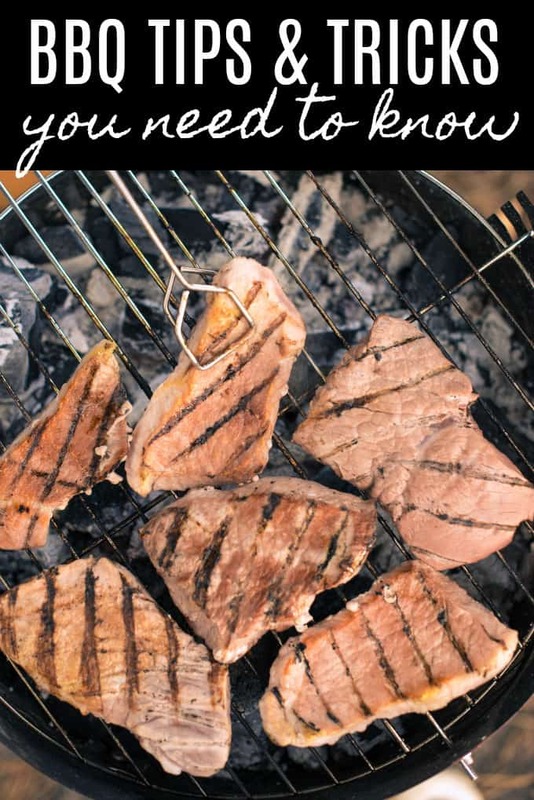 It’s grilling season so take advantage of these tips and have yourself a great al fresco dinner! Do you have any tips to share that we didn’t cover? I love to add wood to the cooking process because it really gives the meat a delicious smoky flavor. I also loved heating up my buns for burgers on the grill to give them a tasty crispy flavor. We love to bbq in the Summer months! I have never tried pizza on the BBQ, guess it is one of those things I should put on the to try list! This is good information, I sometimes get to grill on a friend’s grill, but I don’t get enough experience to feel confident, and sure don’t want to ruin anything! These are great BBQ tips. We love our veggie packets! Possibilities are endless! Great tips for grilling, what a shame I haven’t got a BBQ. I have heard that you should no longer use a wire brush to clean the grill with. It seems people are getting bits of wire stuck in their throats that have become attached to the meat. Great advice and ideas! I love grilling. Pinned and sharing! All good tips for a great bbq experience. We bbq all year round here. I really should clean the grill off at the end of the meal, not waiting until the next time I heat it up. Good tip! Very good on cleaning the grill, my husband never cleans it right away and complains every time LOL. Great BBQ tips! We discovered grilling veggies last year and it really is a game changer! Thanks for sharing these BBQ tips. We love corn on the grill! I have never tried BBQ pizza but will have to!